From a small garden to a vast landscape, the lighting requires careful and strategic planning. Artificial light provides a different perception and visual composition compared to daylight. With well-considered design, a lighting scheme can add depth, rhythm and drama to outdoor space, drawing people in to enjoy it. The lighting should not be a simple add-on at the end. It should be considered from the start because it forms an integral part of the planning process, which allows an evolving environment to be captured. Less is often more. What is not illuminated is as important as what is; it’s about enjoying and not taking too much away from the darkness. Decide what type of atmosphere is required. Daylight offers a balanced level of illumination, whereas night-time illumination evokes a series of subconscious responses, from intimacy to fear. So the first question should be: how do you want the space to feel – functional or dramatic, theatrical or intimate? Plan the hierarchy of the space and then decide what focal points to illuminate and at what light levels – the largest or most beautiful point(s) should be the brightest and then everything else should follow from there. Different light levels at various heights will form pockets of illumination and shadow, which will create contrast and drama – a vital ingredient for an intimate and intriguing environment. With planned and clever use of light you can create focal points, depth, foreground, midground and background. But don’t overlook function; consider where task lighting is required, such as a BBQ or dining area, a walkway or driveway. The eye is always drawn to the brightest point in a space, so concentrate on the effect of light by concealing luminaires where possible. For example, if high levels of light are required on a terrace mount the light fittings on the building so that they aren’t visible when looking out of the window – it’s just the effect of light that’s seen. Equally, if illuminating steps, stairs or pathways it’s often better to use concealed or shielded light sources so that people don’t look directly into a bright light. Where relevant outdoor lighting should work in partnership with indoor lighting. If there’s an internal space, such as a residential property, it’s about extending the inside out and bringing the outside in – this will make the interior space feel larger and prevent windows from becoming black mirrors at night. An illuminated terrace can extend a room inside, while the interior lighting can cast a glow on the outdoor space, creating a soft overarching ambiance. Be aware of reflection on glazing though, because it can hinder the view. 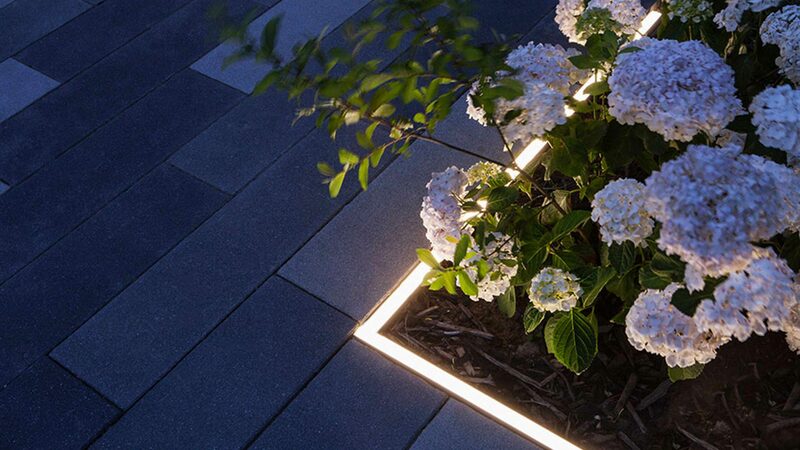 Navigation and safety are intrinsic parts of any outdoor lighting scheme. Entrances, pathways, steps etc, can be illuminated tastefully and safely, and those who work in or maintain outside space should be able to do so in a safe manner. Allow for maintenance and environmental conditions. Consider the location of luminaires, drivers and control gear, along with how they will be accessed (no one wants to dig up a pathway). Cabling is also very important – use ducting or steel wire armoured cable to ensure it’s not easily severed. Use top quality light fittings that are durable and suitable for the conditions (temperature, seasons, saltwater, footfall, wildlife etc) and lamps with a long life to ensure minimal upkeep. Condensation is always a problem so use adequate Ingress Protection (IP) rated fittings to prevent moisture entry. In hot climates, like the Middle East, light fittings should also be heat resistant – extreme temperatures can easily damage them. Play with the tonality of foliage to create visual interest. Find light sources that mirror and enhance the hue of the foliage – this might mean mixing colour temperatures, but that’s fine. For example, red leaves would benefit from a slightly warmer tone on them to pull the warmth out, whereas a light source with a cooler colour temperature would enhance foliage with a bluer hue. Consider the quality and type of plant life. Some foliage can look stunning when backlit because the leaves have a luminosity to them. For deciduous trees think about lighting the trunk, not the canopy, to pick up the gnarly-ness and beauty of the old wood. For fuller, lush canopies gentle levels of illumination work well: by mounting light fittings up in trees light bleeds through like moonlight to form a dappled light effect on the floor. Be sensitive to surrounding environments. Light trespass (and ultimately pollution) is a nuisance and a waste of energy. The perception of brightness is relative and light levels should be contextual: a suburban/ rural outdoor space will need very little light to feel quite beautiful, whereas an urban outdoor space will need more light because it’s in an already bright area. Uplighting is popular because it creates a good effect, however it must be well thought out in order to avoid light spill. The beam angle, cut off and output must be appropriate to the area and object being illuminated. If light fittings are shielded and located correctly then light will wash the object perfectly with minimal spill. 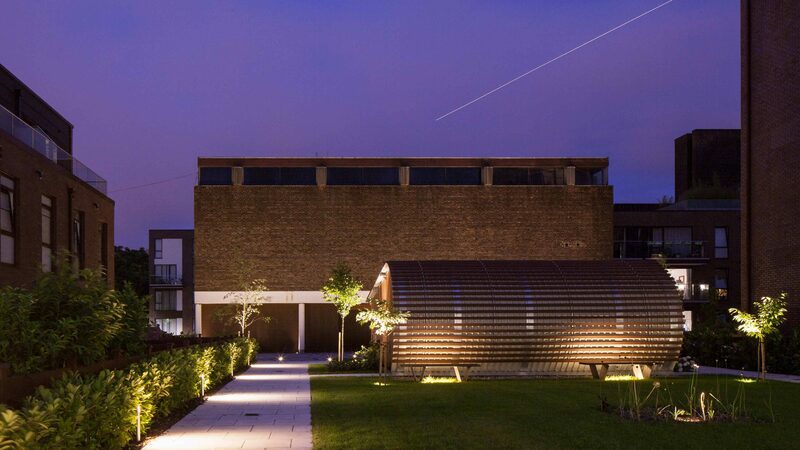 What should be avoided is security-style floodlighting – it’s never a good idea (apart for its true purpose). Instead of one unflattering light that illuminates everything, rely on reflected light from surrounding surfaces and smaller lights layered throughout a space. Lighting control systems can allow easy management of outdoor lighting, such as an astronomical time clock or photocell sensors, to more complex arrangements. Essentially, with a properly planned design an outdoor space can have dynamic lighting that provides numerous different lighting scenes or settings, which can include winter, summer and party modes. 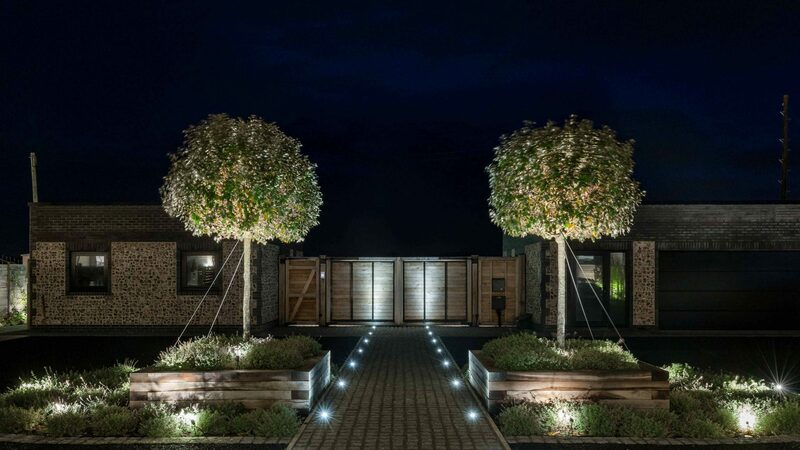 Last but not least, the shape, texture and colour of planting will change over time and/ or seasons, so it’s important to take this into account when planning and designing an outdoor lighting scheme.